Wine bottles covered the table, like a thick glass forest. It’s not that the ten of us were heavy drinkers. We had simply gathered what was left of a Central Coast wine tasting and brought it, along with author Mira Advani Honeycutt, who had been signing her book “California’s Central Coast: The Ultimate Winery Guide,” into Chakra’s cool dark dining room. 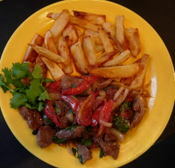 During the wine tasting, the restaurant had sent out little nibbles such as papri chat (garbanzos in tamarind sauce on crisp pastry) and curried vegetables on long, thin banana chips. These were so delicious th at we wanted to try more. Chakra, an upscale Indian restaurant in Beverly Hills, offers a daily tasting menu. It’s considerate to order this in advance, but Chef Mel Oza was game enough to put one together on the spur of the moment. Oza knows Indian food from the source, for he was born in Pondicherry, the former French settlement on the east coast of India, of parents from Gujarat on the west coast. At Chakra, he gives the food a contemporary twist, tempers the spiciness and emphasizes artful presentation. After papads (crisp lentil wafers) and chutneys we started in on a series of small dishes that only seemed small because they were presented in oversized white chinaware. No complaints about lack of food, though. We were quite full by the end. Masala eggplant, the first course, came with a mushroom puff, an elegant reworking of a samosa in fine, light pastry rather than the usual sturdy wrap. A salad of lightly spiced watermelon cubes on frisee lettuce sat at one end of double-roasted coriander sea bass. At the other end, mushroom-pea gravy swirled toward the edge of the plate. Chicken tikka masala, the national dish of England, may be commonplace, but Chakra glamorized it with thin strands of yogurt piped over the creamy tomato sauce. The sauce was rich but subtle, and the small cubes of chicken were sublimely tender. Most Indian restaurants serve lamb vindaloo, but Chakra gets fancy with Lamb Vin d’Alho, or meat cooked with wine (vinegar) and garlic. It’s the same dish, renamed to reflect its origin with the Portuguese who colonized Goa on the west coast of India. Traditional vindaloo is very, very spicy, but this version had hardly been touched by a chile. Oza sent out a seafood curry for those who ate only chicken and fish and accompanied both dishes with a rice pullao that contained khoya, which is milk boiled down to a solid state, raisins and bits of eggplant. Dessert gave a nod to kulfi, India’s cone-shaped ice cream. A small pale green length of pistachio kulfi sat between tiny portions of strawberry-topped cake and a wedge of cinnamon flan on a pretty, sparkly platter. Matching wine with this food was easy. We just poured whatever bottle was close at hand. Top choices at my end of the table were Tablas Creek Rose 2006, Buttonwood Sauvignon Blanc 2005 and Windward Estate Pinot Noir 2005. Sometimes beer is a better companion to Indian food, but Chakra’s lightly seasoned dishes made a showcase for our wines rather than drowning them out with loud, spicy flavors. The Spontaneous Tasting Menu is $59 to $79 at Chakra Cuisine, 151 S. Doheny Drive, Beverly Hills, CA 90211. Tel: (310) 246-3999. Would this be a last visit? That’s what I wondered when I went with friends to Ristorante La Luna for dinner last night. La Luna, a fixture on Larchmont Boulevard, has been fighting eviction proceedings for months. Although in limbo, the restaurant carries on as usual. At least, we saw no evidence of all this angst as we dipped our bread in olive oil, sipped wine and ate huge portions of pasta. The landlord may have a stranglehold on La Luna, but the restaurant has a powerful retaliatory weapon—priest stranglers. These appear on the menu as lo strozzaprete con funghi e piselli. According to legend, tough, bulky, hard-to-swallow pasta would discourage greedy clerics from eating too much when they made an inconvenient visit to a parishioner’s home at mealtime. They simply would not be able to choke down the food. La Luna’s stranglers are sturdy, but not forbiddingly tough, and the plate is so generously heaped that I couldn’t finish. Perhaps the stranglers were at work. 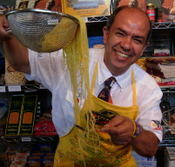 The fat lengths of pasta, made there, come in a cream sauce with peas and mushrooms. The waiter’s eyes lit up when I ordered this dish, which meant that he liked it a lot, not that I was an unwelcome guest to be banished as quickly as possible. As a matter of fact, we lingered for quite some time, enjoying what we hope will not be our last supper at this pleasant trattoria. 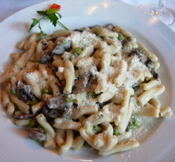 Lo Strozzaprete con funghi e piselli is $12.50 on the dinner menu at Ristorante La Luna, 113 N. Larchmont Blvd., Los Angeles, CA 90004. Tel: (323) 962-2130. Jayanta Paul, a chef from Mumbai (Bombay), cooked wonderful dishes for Maurya, a now-vanished restaurant in Beverly Hills. For brunch one Sunday, he prepared cauliflower so delicious that I begged for the recipe. Slightly sweet, with a sumptuous creamy tomato sauce, it would have fit right in at a Mogul banquet. I’ve lost track of Chef Paul, but I make his cauliflower often. Once I took it to a potluck dinner where ther e was a great spread of food, none of it Indian. Although it didn’t seem to fit, the cauliflower was a great hit and disappeared rapidly, while other dishes lingered. The recipe calls for dried fenugreek leaves (methi). These are readily available in Indian markets, but can be left out, or chopped parsley added for color, although the flavor is not the same. Cut the cauliflower into florets. Wash in cold water and drain. Heat the oil in a non-stick wok or deep skillet. Add the cauliflower and 2 tablespoons water. Sprinkle with 1 teaspoon salt. Cover and cook, stirring occasionally, until the cauliflower is tender, 15 to 20 minutes. Drain and set aside. Cut the tomatoes into quarters. Place in a deep saucepan. Add 1 cup water, the ginger and garlic pastes (to make these, pound garlic cloves and sliced ginger root in a mortar until pulverized), the cardamom pods, cloves, chili powder and 1 teaspoon salt. Bring to a boil, reduce the heat and simmer, uncovered, for 30 minutes. Remove from heat and allow to cool slightly, then turn into a blender and blend well. Strain through a sieve. Melt 1 tablespoon butter in the cleaned wok or skillet. Add the slivered ginger root and sauté for 30 seconds. Add the strained sauce and fenugreek leaves and bring to a boil. Add the cauliflower and boil, uncovered, for 2 minutes. Reduce the heat to a simmer. Add the whipping cream and stir to blend. Add the remaining tablespoon butter and stir until melted and blended with the sauce. Stir in the honey. Turn into a heated serving container and garnish with cilantro. 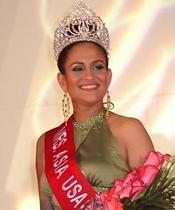 Not many people mingle with queens, but I am fortunate enough to know one of them, Smita Salgaonkar, who reigns as Mrs. Asia USA 2007. Smita is statuesque, gorgeous, talented and smart. Best of all, she is a fabulous cook. Years ago, I watched her make South Indian dosais, swirling a batter of ground rice and lentils onto a skillet to make thin golden “crepes.” They were delectable, and so was the enchanting rose-flavored ice cream that she had prepared for dessert. We didn’t know it then, but that ice cream predicted her future as clearly as if it had been an image in a crystal ball. Today Smita is founder and president of Neemo’s Exotic Ice Creams, which is based in Orange, California, and she has opened an ice cream parlor and snack shop called Saffron Spot in Artesia’s Little India. The 25 flavors served there include her signature saffron silk, rajbhog, a rich tasting blend of pistachios, almonds and cashews seasoned with saffron and cardamom; mango, chikoo (sapote), lychee, pomegranate, badam (almond), kulfi (Indian style ice cream) and banana cardamom. Born in Mumbai, India, Smita lives in Orange County. Her royal activities and businesses keep her busy, but when she has time to cook, she’s likely to make a favorite chicken dish, a recipe from Mai Ghag, mother of a friend and author of a small book of recipes for Indians living in the United States. Although Indian dishes often require complex seasonings and procedures, Smita’s Saffron Chicken is so simple it’s almost no work at all. A shortcut is to marinate the chicken in the seasonings overnight. Then all you have to do the next day is bake it with a topping of browned onions. In a blender or food processor, combine the yogurt, water and 2 tablespoons oil. Add the almonds, garlic, ginger root, lime juice, chili powder, turmeric, saffron, methi seeds and salt to taste. Blend or process until finely ground. Place the chicken in a container with a tight lid. Add the yogurt marinade and mix well. Cover and refrigerate overnight. The next day, bring the chicken to room temperature. Fry the onion in 2 to 3 tablespoons oil until browned, which will take about 12 to 15 minutes. Preheat the oven to 400 degrees. Arrange the chicken and marinade in a baking dish with a lid. Top with the browned onions. Cover tightly and bake 50 minutes. Remove from the oven and let stand with the cover on for 15 minutes. To serve, garnish the chicken with cilantro and serve over rice or with naan bread. 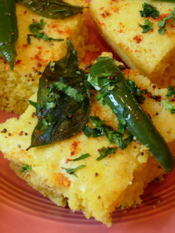 When I was in Calcutta, I ate dhokla for breakfast every day. I would walk from my hotel on Shakespeare Sarani through an alley and around a corner to Haldiram’s, a shop famous for sweets and snacks. The sumptuous display of milky Bengali sweets was irresistible, but I had eyes only for the savory yellow squares of dhokla. Moist and cakelike, they looked like cornbread, but the yellow came from turmeric, not cornmeal. And the batter was composed of lentil flour, yogurt and spices. I was so impressed that I bought a package of dhokla mix to take home, but I don’t need that any more because I’ve discovered real homemade dhokla a short drive from where I live. Hot red chile in the batter and jalapeno slivers on top make the dhokla spicy, and tamarind chutney provides the same sweet-sour effect as at Haldiram’s. The dhokla maker is Nirmala Kasliwal, who is from Ujjain in Madhya Pradesh. Dhokla is $1.25 a a square at the Samosa House/Bharat Bazaar, 11510 W. Washington Blvd., Culver City. CA 90232. Tel: (310) 398-6766. Open daily from 11 a.m. to 9 p.m. I could pack up and head for India tomorrow. 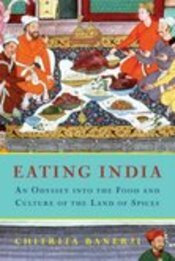 That’s how mesmerizing it is to read Chitrita Banerji’s book “Eating India” (Bloomsbury; $24.95), an account of her culinary meanderings over a period of three years. Banerji, a Bengali transplanted to Cambridge, Mass., has written a great deal about Indian food, including “Life and Food in Bengal,” which I bought after spending time in Calcutta, her home city. That book includes recipes. 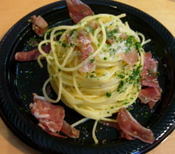 The new one does not, but it evokes extraordinary food images. Just imagine this legendary sweet of the past: a pomegranate formed of a sugar shell that encloses seeds of jellied pear juice molded around almond kernels. As she travels, Banerji meets friends for memorable meals, interviews culinary authorities, looks at history and architecture and researches such themes as a possible Portuguese influence on Bengali milk sweets, although she finds only a nebulous link. In this book, though, the journey is more important than the results. Banerji visits Amritsar, Delhi, Benaras (Varanasi), Bombay, Goa, Bangalore, Hyderabad, Cochin and many other sites, including northeastern India, home to tribal groups whose cooking shows the influence of Burma and Thailand. Along the way, we learn about the “Jewish cooks” of Calcutta, not cooks of the Jewish faith but Muslims who prepared food for the community of Baghdadi Jews that was once prominent there. Then there are the East Indians of Bombay, converted centuries ago to Catholicism by the Portuguese and possessors of a little known but distinctive cuisine. And the Syrian Christians of Kerala, the only Indians who eat without religious or cultural restrictions. At the other extreme are the rigidly vegetarian Jains, who eat nothing pulled from the earth for fear that an insect could have been harmed and avoid seeded fruits and vegetables because seeds imply life. Banarji recalls that, as a child in a Calcutta household, she was required to wash her hands if she touched, no matter how lightly, a bowl contaning mashed potatoes seasoned with onions or a pot of cooked rice. The book ends with a poignant observation that even her best efforts to cook Indian food at home “will produce only an approximation of what I grew up eating; things don’t taste the same in India and America.” That’s all the more reason to go to India with Banerji's book in hand. My wife and I go to Pailin almost every weekend. My favorite is the Isaan (northeastern Thai) dishes. They have the best somtam (green papaya salad), tod mun goong (shrimp cakes), northern sausage, and they make great sliced beef with spicy sauce, called sua long hai (crying tiger). They also serve frog in three different ways for the adventurous. Pailin Thai Cuisine, 5621 Hollywood Blvd., Los Angeles, CA 90028. Tel: (323) 467-6775.